The CC-chemokine receptor 4 (CCR4) is thought potentially to play a critical role in asthma pathogenesis due to its ability to recruit type 2 T-helper lymphocytes to the inflamed airways. Therefore, CCR4 provides an excellent target for anti-inflammatory therapy. The safety, tolerability, pharmacokinetics and pharmacodynamics of the CCR4 antagonist GSK2239633, N-(3-((3-(5-chlorothiophene-2-sulfonamido)-4-methoxy-1H-indazol-1-yl)methyl)benzyl)-2-hydroxy-2-methylpropanamide, were examined in healthy males. Two studies were performed: 1) an open-label, study in which six subjects received a single intravenous infusion of [14C]-GSK2239633 100 μg (10 kBq) (NCT01086462), and 2) a randomised, double-blind, placebo-controlled, cross-over, ascending dose study in which 24 subjects received single oral doses of GSK2239633 150–1500 mg (NCT01371812). Following intravenous dosing, plasma GSK2239633 displayed rapid, bi-phasic distribution and slow terminal elimination (t½: 13.5 hours), suggesting that GSK2239633 was a low to moderate clearance drug. Following oral dosing, blood levels of GSK2239633 reached Cmax rapidly (median tmax: 1.0–1.5 hours). Estimated GSK2239633 bioavailability was low with a maximum value determined of only 16%. Food increased GSK2239633 systemic exposure (as assessed by AUC and Cmax). Increases in AUC and Cmax were less than dose proportional. Adverse events were reported by three subjects (50%) following intravenous administration, and by 19 subjects (79%) following oral administration; most (46/47; 98%) events were mild/moderate in intensity. GSK2239633 1500 mg inhibited thymus- and activation-regulated chemokine-induced (TARC) actin polymerisation reaching a mean CCR4 occupancy of 74%. In conclusion, GSK2239633 was well-tolerated and capable of inhibiting TARC from activating the CCR4 receptor. Allergic asthma is characterised by chronic inflammation of the airways, commonly triggered by environmental aeroallergens. This inflammatory process in asthma is characterised by inflammatory cell recruitment, increased mucus production, periodic airway smooth muscle contraction and vascular vasodilation[1–4]. Subsequently, Type 2 T helper (Th2) lymphocytes, and other cell types, are recruited from peripheral blood into the inflamed tissue where they produce cytokines that induce eosinophil recruitment, stimulate the production of allergen-specific immunoglobulin E by B-cells and increase the permeability of the endothelium to allow further recruitment of inflammatory cells[5–7]. One mode of Th2 lymphocyte recruitment to inflamed airways[8–11] is through the specific binding of the chemokines thymus- and activation-regulated chemokine (TARC) and monocyte-derived chemokine (MDC) to the CC-chemokine receptor 4 (CCR4) expressed on the surface of a subset of Th2 cells[12–17]. High levels of TARC and MDC have been detected in the lungs of patients with asthma following an allergen challenge[18, 19], and high numbers of Th2 cells recovered in bronchial biopsies from patients with asthma have been found to be CCR4 positive[20–22]. As chemokine receptors play a key role in inflammatory processes, they provide excellent targets for anti-inflammatory therapy[23–26]. The targeting of CCR4 is believed to be a safe strategy as initial clinical studies with mogamulizumab, a humanised anti-CCR4 monoclonal antibody, have given no indication of an increase in the number of infections or any degree of immunosuppression related to mogamulizumab. Further, there was no evidence of any CCR4-specific adverse clinical effects in patients with T-cell lymphomas treated with mogamulizumab. GSK2239633 N-(3-((3-(5-chlorothiophene-2-sulfonamido)-4-methoxy-1H-indazol-1-yl)methyl)benzyl)-2-hydroxy-2-methylpropanamide, compound 7r in, is an allosteric antagonist of human CCR4. In vitro, GSK2239633 inhibited the binding of [125I]-TARC to human CCR4 with a pIC50 of 7.96 ± 0.11 and also inhibited TARC-induced increases in the F-actin content of isolated human CD4+ CCR4+ T-cells with a pA2 of 7.11 ± 0.29 [unpublished observations]. Conflicting pharmacokinetic profiles for GSK2239633 were obtained in the rat and dog, leading to variable predictions of the human pharmacokinetic profile. Therefore, before oral GSK2239633 was administered to humans for the first time, a Microdose Intravenous Study using a radio-labelled dose of GSK2239633 was conducted in healthy subjects. This Microdose Intravenous Study revealed that plasma clearance of GSK2239633 was low to moderate or approximately 40% of liver blood flow when plasma clearance was converted to blood clearance. To obtain information at a potentially clinically relevant dose level, a study using single ascending oral doses of GSK2239633 was conducted in healthy subjects. Here we report the results obtained in both of these clinical studies. All subjects provided signed and dated informed consent prior to screening. Local Ethics Review Committees provided approval for both studies (Microdose Intravenous Study: Independent Ethics Committee of the Foundation “Evaluation of the Ethics of Biomedical Research”, Assen, The Netherlands; Single Oral Dose Study: Medische Ethische ToetsingsCommissie, Stichting Beoordeling Ethik Biomedisch Onderzoek, Assen, The Netherlands) and they were conducted in accordance with Good Clinical Practice and the guiding principles of the 2008 Declaration of Helsinki. Healthy subjects aged 18–50 years with a body mass index of 18.5–29.9 kg/m2 were eligible. Subjects had to be non-smokers or ex-smokers for a minimum of 6 months prior to screening and with a smoking history of <5 pack years. Exclusion criteria included positive testing for hepatitis B surface antigen, hepatitis C antibody and human immunodeficiency virus. Subjects unwilling to abstain from red wine, Seville oranges, grapefruit or grapefruit products 7 days prior to dosing were also ineligible. Healthy subjects aged 18–65 years with a body mass index of 18.5–29.9 kg/m2 and a smoking history as described for the Microdose Intravenous Study were eligible. Key exclusion criteria were as for the Microdose Intravenous Study. This was an open-label, single-dose study conducted from 21 January 2010 to 18 February 2010 at PRA International, Zuidlaren, The Netherlands (GlaxoSmithKline protocol: CC4114041; Clinicaltrials.gov identifier: NCT01086462). Subjects received a single intravenous infusion of approximately 10 kBq [14C]-GSK2239633 100 μg over 15 minutes. Subjects attended a screening visit within 30 days prior to receiving the first dose of study medication. Subjects were admitted to the clinical unit on Day −1 and remained there until 48 hours post-dose. As this was the first time GSK2239633 100 μg had been administered to humans, dosing was staggered so that only one subject received the study medication on Day 1. As the study medication was well-tolerated, the remaining subjects were dosed the following day in a staggered dosing schedule (20-minute interval between dosing of the subjects). Subjects received a follow-up telephone call 4–10 days after the last dose of study medication. This was a randomised, double-blind, placebo-controlled, cross-over, single ascending-dose study conducted from 29 March 2011 to 1 July 2011 at PRA International, Zuidlaren, the Netherlands (GlaxoSmithKline protocol: CC4114660; Clinicaltrials.gov identifier: NCT01371812). Subjects completed a screening visit within 28 days prior to receiving the first dose of study medication. Subjects were admitted to the clinical unit the day before each dosing session for baseline assessments that included a physical examination and clinical laboratory tests. Single ascending oral doses of GSK2239633 or placebo were administered to two interlocking and alternating cohorts (Additional file1: Figure S1) (Cohort 1 and Cohort 2), each of which consisted of 12 male subjects randomised to receive either active or placebo (eight active: four placebo). The randomisation schedule was generated prior to the start of the study using validated internal software. Subjects from Cohort 1 underwent four dosing sessions; the starting dose of GSK2239633 was 150 mg, followed by 600 mg, 1200 mg and 1200 mg after eating the standard United States Food and Drug Administration (FDA) high fat/high caloric meal to assess any food effect. Subjects from Cohort 2 underwent three dosing sessions; the starting dose of GSK2239633 was 300 mg, followed by 900 mg and 1500 mg. As this was a first-time-in-human study, dosing was staggered over 2 days so that on Day 1 one subject received GSK2239633 and one subject received placebo at each dosing session in both cohorts (with the exception of the food effect dosing session for Cohort 1). On Day 2, the remaining subjects were dosed provided GSK2239633 was well-tolerated on Day 1. Subjects fasted for 10 hours before each dosing session, except those in last period of Cohort 1 who ate 30 minutes prior to administration of GSK2239633 1200 mg. For both cohorts, no food was permitted up to 4 hours after administration of study medication. During a 2-hour period (1 hour pre-dose until 1 hour post-dose), no water was allowed with the exception of that taken with the study medication (240–300 mL). After receiving randomised treatment, subjects underwent a period of observation and assessments for 3 days. They returned to the clinical unit, following a washout period of approximately 14 days, to receive their next randomised dose of study medication, with additional 3-day inpatient assessments. Subjects returned for a follow-up visit 10–14 days after their last dose of study medication. Subjects were dosed over 15 minutes with: 10 μg/mL GSK2239633 (14C-labelled) in a saline solution for infusion (0.9% w/v sodium chloride solution) containing 10% w/v (2-hydroxypropyl)-beta-cyclodextrin. Blood samples for pharmacokinetic analysis of plasma total radioactivity and GSK2239633 were collected at screening, Day −1, pre-dose and at 5, 10, 15, 20, 30, 45 minutes and 1, 1.5, 1.75, 2.25, 3.25, 4.25, 6.25, 8.25, 12.25, 16.25, 18.25, 24.25, 30.25, 36.25 and 48.25 hours from start of the infusion. Urine samples were collected prior to dosing and then until 24 hours after the infusion ended. Subjects were dosed with GSK2239633 as a capsule formulation (Swedish orange coloured opaque hard gelatin capsules) with a unit dosage strength of 150 mg. Subjects received between one and 10 capsules (depending on the dose level), which were swallowed with 240 mL of water (or up to 300 mL of water in total for the higher number of capsules). Subjects randomised to placebo in each dosing session received the same number of capsules as those randomised to active treatment for the same dosing session. Blood samples were drawn for pharmacokinetic analysis pre-dose and at 5, 15 and 30 minutes and 1, 2, 3, 4, 8, 10, 24 and 48 hours post-dose. For pharmacodynamic analysis, blood was collected pre-dose and at 1, 4 and 24 hours post-dose. The pharmacodynamic analysis was only conducted for subjects in the fasted condition; no analysis was performed for the fed cohort. An aliquot of urine was collected pre-dose; after dosing, all urine was collected and pooled during a 24-hour interval. The primary endpoints were maximum observed concentration (Cmax), area under the concentration-time curve from time 0 to last measurable concentration (AUC0–t), AUC from time 0 extrapolated to infinity (AUC0–∞) and terminal half-life (t½) of GSK2239633 and [14C]-radioactivity, apparent clearance (CL) and volume of distribution at steady state (Vss) of GSK2239633 and cumulative urinary excretion of total radioactivity for 24 hours post-dose. Total radioactivity was measured directly by accelerator mass spectrometry. Plasma GSK2239633 concentrations were determined using an internally validated analytical method by accelerator mass spectrometry (further details provided as Additional file1 material). Urine radioactivity levels were measured by liquid scintillation counting with an external standardisation method. The lower limit of quantification (LLQ) was 0.98 pg/mL for the plasma assay and 10 pg GSK2239633 equiv/mL for the total plasma radioactivity assay. The LLQ for GSK2239633 in urine was 5 μg GSK2239633 equiv. Pharmacokinetic parameters for each subject were derived from plasma GSK2239633 concentration-time profiles by non-compartmental analysis using WinNonlin Professional Edition Version 5.2 or above (Pharsight Corporation, Mountain View, USA). Maximum observed concentration, time to Cmax (tmax), AUC from time 0 to 48 hours post-dose (AUC0–48), AUC0–t, AUC0–∞, CL, t½, volume of distribution during terminal elimination phase (Vd) and Vss were determined. Blood concentrations of GSK2239633 were determined by an internally validated analytical method based on extraction from a dried blood spot disc by addition of methanol, followed by high performance liquid chromatography/tandem mass spectrometry. The LLQ of the assay was 10 ng/mL (further details provided as Additional file1 material). Analysis and derivation of pharmacokinetic parameters were conducted as for the Microdose Intravenous Study. The primary endpoints of the Single Oral Dose Study were adverse events and clinically relevant changes in safety parameters. Adverse events were recorded throughout both studies. For each event, the potential causal relationship with the study drug was assessed by the investigator. Other safety assessments in both studies included clinical laboratory tests (chemistry, haematology, urinalysis), vital signs, 12-lead electrocardiogram (ECG) and continuous cardiac telemetry. Blood samples (9 volumes) were collected into a 3.8% sodium citrate solution (1 volume) and incubated for 15 minutes at room temperature with saturating concentrations of fluorescein isothiocyanate (FITC)-conjugated mouse anti-human CD4 antibody and non-inactivating phycoerythrin (PE)-conjugated mouse anti-human CCR4 antibody (BD Biosciences, Oxford, United Kingdom), or appropriate isotype control antibodies. The samples were then incubated for 30 minutes at 37°C. For pre-clinical studies, antagonists or vehicle were added at the beginning of this incubation. Following this, the blood cells were incubated for 15 seconds with varying concentrations of TARC (PeproTech EC, London, United Kingdom) before addition of 10 volumes of fluorescence-activated cell sorting (FACS) lysing solution (BD Biosciences, Oxford, United Kingdom). After 30 minutes, the blood cell suspension was centrifuged (500 g for 5 minutes) and resuspended in fresh FACS lysing solution for further 10 minutes to ensure complete red blood cell lysis. The cell suspensions were centrifuged (500 g for 5 minutes) again and washed twice by resuspending in phosphate buffered saline (PBS) solution and centrifuging at 500 g for 5 minutes. After incubating the cell suspensions for 15 minutes with lysophosphatidylcholine (100 μg/mL) and Alexa fluor 647 phalloidin (0.075 units/mL), the cells were recovered by centrifugation at 500 g for 5 minutes and resuspended in PBS. The F-actin content of the CD4+ CCR4+ lymphocytes in each sample was determined on a FACSCantoII flow cytometer by measuring the mean Alexa fluor 647 fluorescence intensity of 1,000 cells. This was expressed as a fraction of the Alexa fluor 647 fluorescence intensity of the CCR4– lymphocytes in the same sample. The fractional occupancy of CCR4 (Ro) was then estimated by determining the dose-ratio (DR) from the change in effective concentration giving 50% of the maximal response (EC50) of the TARC concentration-response curve before and after dosing with GSK2239633 and using the formula Ro = (DR – 1)/DR. No formal sample size estimation was performed. As this was an exploratory study, no formal statistical hypotheses for safety, tolerability or pharmacokinetics were tested. No statistical analysis was done to determine the sample size. There was no statistical analysis of safety parameters. Dose proportionality was primarily evaluated based on Cmax, AUC0–10 and AUC0–t using the power model. Each parameter was loge-transformed prior to analysis. Additionally, a mixed model was fitted to the dose-normalised pharmacokinetic parameters to compare each dose with the reference dose (GSK2239633 150 mg). The data were loge-transformed prior to analysis and the results were then back-transformed to calculate ratios between the doses. Food effect was assessed by performing a statistical analysis of Cmax, AUC0–10 and AUC0–t after loge-transformation of the data. An analysis of variance (ANOVA) model was fitted along with 90% confidence intervals (CIs) by a mixed effects model, with fed/fasted condition as a fixed effect and subject as a random effect. Using data obtained in the Microdose Intravenous Study it was possible to make an estimation of GSK2239633 bioavailability following oral administration. For that, AUC0–10 was used as a comparison. For the pharmacodynamic analysis, population estimates of the parameters, such as EC50, were derived using non-linear mixed effects models in NonMEM Version 7 (ICON Development Solutions, PA, USA) for all profiles generated. Analysis of the entire individual pharmacodynamic and pharmacokinetic datasets was conducted to derive mean EC50 estimates pre-dose and in the presence of GSK2239633 (each subject acted as their own control as their pre-dose data was compared with their post-dose data). Although not a direct method for formal calculation of Ro, this DR was used to give an estimate of Ro as described above. Six male subjects were enrolled and completed the study. The population mean [range] age was 22.7 [20.0–26.0] years and mean [range] body mass index was 22.1 [19.3–24.6] kg/m2 (Table 1). All subjects were Caucasian. Twenty-four male subjects were enrolled and completed the study. The population mean [range] age was 37.2 [20.0–65.0] years and mean [range] body mass index was 24.9 [19.8–29.1] kg/m2 (Table 1). Twenty (83%) subjects were of Caucasian/European heritage, one (4%) subject was of Central/South Asian heritage, one (4%) subject was of South East Asian heritage and two (8%) subjects were of Arabic/North Africa heritage. Following infusion, the plasma pharmacokinetics of GSK2239633 and total plasma radioactivity showed a rapid bi-exponential distribution phase followed by a slow terminal elimination phase. Terminal elimination t½ values were 13.5 hours (95% CI: 9.6, 18.8) for GSK2239633 and 31.6 hours (95% CI: 25.4, 39.3) for total plasma radioactivity (Table 2). Values of AUC for GSK2239633 were half those obtained for total plasma radioactivity (AUC0–48: GSK2239633, 4.420 ng.hour/mL; total plasma radioactivity: 8.840 ng GSK2239633 equiv.hour/mL). The intrinsic plasma clearance (CL: 21.9 L/hour) was low to moderate. The observed Vss and Vd values of 119 L (95% CI: 78.4, 182.0) and 424 L (95% CI: 275.0, 654.0), respectively, for GSK2239633 were relatively high suggesting good distribution of GSK2239633 from the plasma compartment into tissues. However, a degree of caution should be taken when interpreting the apparent high distribution since there was evidence in several subjects of secondary peaks in the concentration-time profiles although data were sparse. The amount of radioactive drug-related material recovered in the urine accounted for approximately 20% of the administered dose. * Concentrations are in ng GSK2239633 equiv/mL and ng GSK2239633 equiv.hour/mL for Cmax and AUC, respectively. CI: confidence interval; Cmax: maximum observed concentration; AUC0–48: area under the concentration-time curve from time 0 to 48 hours post-dose; AUC0–∞: area under the concentration-time curve from time 0 extrapolated to infinity; t½: half-life; CL: apparent clearance; Vss: volume of distribution at steady state; Vd: volume of distribution during terminal elimination phase. Absorption of GSK2239633 was rapid with Cmax at 1.0–1.5 hours across the dose range (Table 3). Values of t½ could only be calculated for one subject after the 150 mg and the 1200 mg (fed) doses, and two subjects after the 1200 mg (fed) dose as blood concentrations of GSK2239633 were too erratic and low during the terminal phase for other subjects; for these three subjects, t½ values ranged from 2.9 to 28.3 hours. Generally, both AUC (Additional file1: Figure S2A) and Cmax (Additional file1: Figure S2B) increased with GSK2239633 dose. Results from the power model analysis indicated a less than dose proportional increase for AUC0–10 (adjusted mean slope: 0.61; 90% CI: 0.54, 0.68) and Cmax (adjusted mean slope: 0.76; 90% CI: 0.63, 0.89) as the 90% CIs did not contain unity (Additional file1: Table S1). Dose proportionality results were supported by mixed model analysis as assessed by comparison with the GSK2239633 150 mg dose level. Mean Cmax and AUC0–t for GSK2239633 following a dose of 1200 mg were 695 ng/mL and 2330 ng.hour/mL, respectively; these increased to 1410 ng/mL and 6520 ng.hour/mL when the study medication was administered after a standard FDA high fat/high caloric meal. The analysis of the food effect for GSK2239633 showed an increase of 208% in AUC0–10, 180% in AUC0–t and 103% in Cmax (GSK2239633 1200 mg fed:fasted) in the fed state; all these differences achieved statistical significance (Supplemental Table S2). In addition to the increases observed for Cmax and AUC parameters, absorption of GSK2239633 was more protracted in the fed condition with a median tmax of 3.0 hours. GSK2239633 bioavailability in the fasted state ranged from 12–14% for the two lowest doses studied (GSK2239633 150 mg and 300 mg). For GSK2239633 600 mg and above, estimated bioavailability decreased ranging from 5–9%. In the fed state, GSK2239633 estimated bioavailability increased to approximately 16%. AUC0–10: area under the concentration-time curve from time 0 to 10 hours post-dose; AUC0–t: AUC from time 0 to last measurable concentration; AUC0–∞: AUC from time 0 extrapolated to infinity; ND: not determined; %AUCex: percentage of AUC0–∞ obtained by extrapolation; Cmax: maximum observed concentration; tmax: time to Cmax. Adverse events were reported by three of the six (50%) study subjects. The events reported were abdominal discomfort (n = 1), diarrhoea (n = 1), rhinitis (n = 1) and headache (n = 1); all were mild, transient and had resolved at follow-up. The episode of diarrhoea was the only event judged to be possibly drug-related by the investigator. There were no clinically significant abnormalities in clinical laboratory results, physical exam, vital signs, 12-lead ECG parameters or continuous cardiac telemetry. Nineteen of the 24 (79%) subjects reported adverse events (Table 4). There was no dose response in the incidence of adverse events across dose and treatment groups. Forty-six of the 47 (98%) events were graded as mild or moderate; none was graded as severe. One subject had a skin mole at screening that was subsequently excised and found to be a malignant melanoma. This was reported as an adverse event. The most frequently reported adverse events were headache and diarrhoea. Six subjects experienced events judged to be drug-related by the investigator, the most frequent of which was diarrhoea reported by three (13%) subjects (GSK2239633 600 mg: one; GSK2239633 1500 mg: two; placebo: one). Other events judged to be drug-related were abdominal pain, chest discomfort, headache, oral herpes and somnolence (one subject each). All adverse events resolved by the end of the study except for one episode of joint injury and one episode of folliculitis. No trends were detected in changes from baseline for clinical laboratory test values. The investigator judged there to be no clinically significant abnormalities in vital sign, 12-lead ECG parameters or continuous cardiac telemetry. Dose–response curves for the relative increase in filamentous actin (F-actin) content of CD4+ CCR4+ cells in response to TARC showed that, although highly variable, CCR4 inhibition was evident from GSK2239633 150 mg to 1500 mg (Figure 1). For comparison, the results from in vitro studies assessing the effect of GSK2239633 (1–10 μM) on TARC-induced increases in F-actin content of CD4+ CCR4+ T-cells are also presented (Figure 2). At the GSK2239633 1500 mg dose, the calculated mean level of CCR4 inhibition equated to a predicted Ro of approximately 74% at 1 hour after dosing. Predicted Ro levels decreased over time following the blood pharmacokinetic profile, which showed an initial rapid peak in blood GSK2239633 exposure followed by a rapid decline to much lower levels 4–8 hours post-dose. The Ro estimates for each dose group at 1 and 4 hours post-dose are presented in Table 5. Receptor occupancy estimates at 4 hours post-dose were more variable than those at 1 hour post-dose and therefore, difficult to interpret. Although, this was not unexpected given the low blood exposure of GSK2239633 at the 4 hours post-dose time-point. Blood from placebo subjects, analysed in the same way and at the same time-points, did not show any shifts in the response curves, which would indicate CCR4 inhibition, when the post-dose curves were compared with the pre-dose curves. The placebo data also revealed the inherent variability in the technique as shown by the approximately 3-fold range in variability for the derived EC50 of TARC (pre-dose = 0.34 nM; all data = 0.1–0.34 nM). Population fits per dose level for pre-dose (Panel A) and 1 hour post-dose (Panel B) in the Single Oral Dose Study. Following single oral dosing of GSK2239633, blood samples were collected from subjects and stimulated with TARC as described. Formation of F-actin was determined following staining with Alexa fluor 647 phalloidin and analysis with a FACSCantoII flow cytometer by measuring the mean Alexa fluor 647 fluorescence intensity of 1,000 cells. The ratio of F-actin formation in CD4+ CCR4+ and CD4+ CCR4- T-cells was calculated, and the fractional receptor occupancy of CCR4 (Ro) was then determined by estimating a dose-ratio (DR) from the change in effective concentration giving 50% of the maximal response (EC50) of the TARC concentration-response curve before and after dosing with GSK2239633 and using the formula Ro = (DR – 1)/DR. Thymus- and activation-regulated chemokine-induced increases in F-actin content of CD4 + CCR4 + T-cells in whole human blood in the absence or presence of GSK2239633 at 1 μM, 3 μM or 10 μM. The data presented are the mean of independent determinations in three donors. Error bars represent standard error of the mean. 1 Ro: CCR4 occupancy by GSK2239633 derived from the EC50 ratio (DR) for each dose group divided by the pre-dose EC50 and converted to an estimate of CCR4 occupancy (DR-1/DR). 2 95% CI: calculated from the 95% confidence interval (when available) of the modelled EC50. ** Data generated at 4 hours post-dose with GSK2239633 was highly variable. Ro: receptor occupancy; CI: confidence interval; NC: not calculated, insufficient data to generate a measure of variability. In the Microdose Intravenous Study, the clearance of GSK2239633 was low to moderate (approximately 40% of liver blood flow) with a proportion of the drug appearing to be well distributed based on the long terminal elimination rate observed, albeit at relatively low levels and with signs of secondary input. Prior to the conduct of the Single Oral Dose Study, the systemic bioavailability of GSK2239633 in humans was predicted to be, at best, approximately 70%, based on results of the Microdose Intravenous Study and those obtained in the pre-clinical studies. This assumed that bioavailability was limited only by first pass extraction equivalent to the systemic clearance measured in the Microdose Intravenous Study. However, findings in the Single Oral Dose Study showed that this was an overestimate (see below). Unchanged GSK2239633 accounted for only 50% of the total plasma radioactivity following intravenous administration with the remaining circulating drug-related material comprised of one or more metabolites. A glucuronide conjugate was identified as a major component of the metabolised fraction through a pooled plasma analysis. The blood exposure of GSK2239633 achieved in the Single Oral Dose Study was substantially lower than that expected based on the high oral bioavailability obtained in several pre-clinical species; however, it may be consistent with the physicochemical properties of the molecule, high molecular weight (549) and low solubility (0.02 mg/mL), and could explain the limited absorption window observed in humans. Gastric motility and the presence of food in the stomach could influence the systemic exposure profile of GSK2239633 in the manner observed in this first in man oral study. The food effect analysis supports this hypothesis and administration of GSK2239633 1200 mg in the fed state led to statistically significant increases in Cmax (103%) and AUC parameters (AUC0–10: 208%; AUC0–t: 180%) compared with the fasted state. However, other factors, such as solubility, cannot be excluded. In addition, in the fed state, tmax was delayed by approximately 1.5 hours compared with the fasted state. The estimated bioavailability of GSK2239633 was considerably lower than predicted, achieving a maximum of only approximately 16% (either fasted or fed). Therefore, GSK2239633 exposure in the blood was notably lower than that required to explore a full pharmacodynamic response, which was reflected in the low estimated Ro observed for the actin polymerisation pharmacodynamic endpoint. In these early studies, GSK2239633 had a satisfactory safety and tolerability profile in healthy subjects. No dose-limiting toxicity or maximum tolerated dose was identified. There was no relationship in the frequency or severity of adverse events with increasing doses of GSK2239633. The anti-CCR4 antibody, mogamulizumab, has been tested in clinical studies, although the study population for this was patients with relapsed CCR4+ adult T-cell lymphomas and other peripheral T-cell lymphomas. Mogamulizumab has thus far been shown to be well-tolerated in that study population and none of the adverse events reported were specific to inhibition of CCR4. Pharmacodynamic analysis in the Single Oral Dose Study revealed that GSK2239633 inhibited TARC-induced increases in the F-actin content of CCR4+ T cells in human whole blood. 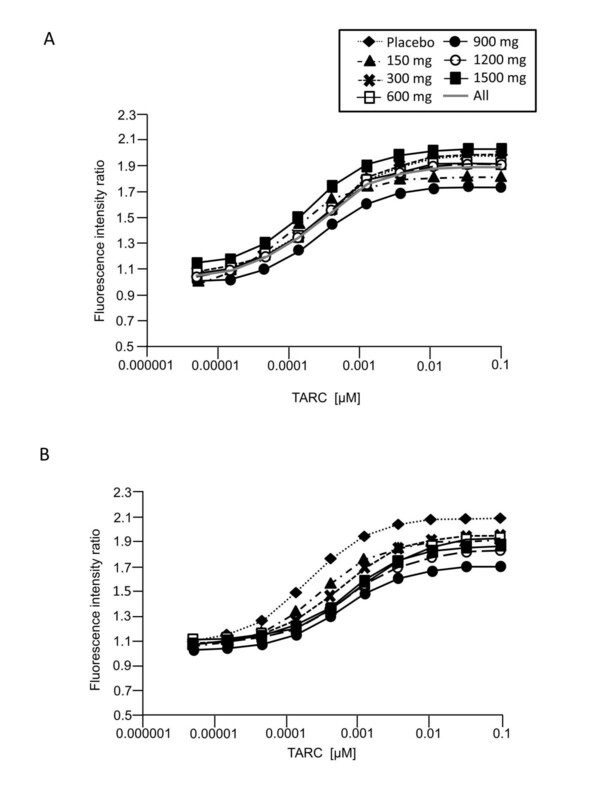 Although, even at the highest dose (1500 mg), the magnitude of inhibition was low (the potency of TARC decreased only 4-fold indicating that the mean estimated receptor occupancy was 74% at 1 hour post-dose) and relatively short-acting (reflecting the rapid reduction of drug concentration and inhibition in the blood at 4 hours post-dose). GSK2239633 failed to achieve the minimum target level of CCR4 inhibition in the blood (≥90% at peak and 50% at trough), and there was no indication of an extended duration of action (prolonged pharmacodynamic response in the absence of pharmacokinetic exposure) in whole blood ex vivo. In this study, we were unable to obtain systemic exposure of GSK2239633 high enough to inhibit CCR4 by more than 80% as measured in the whole blood CCR4 pharmacodynamic assay. This would substantially limit the degree to which we would be able to assess the blockade of CCR4 for clinical benefit in further studies. CC-Chemokine receptor 4 is potentially involved in the pathogenesis of allergic diseases due to its involvement in the pathways leading to the recruitment of Th2 cells to the sites of allergen exposure[22, 33]. A number of small-molecule CCR4 antagonists have shown promising results in various animal models of inflammation, such as reduction in ovalbumin-induced ear swelling in mice, inhibition of ovalbumin-induced airway inflammation in guinea pigs and a reduction in the recruitment of Th2 cells to the lungs in a mouse model of ovalbumin-induced airway allergy. However, no small molecules have progressed to clinical studies thus far[2, 26], which may be due, in part, to poor oral exposure noted in pre-clinical animal models with some of the small molecules reported. A further general challenge with chemokines often speculated upon is the potential for redundancy within the chemokine system and alteration of function during evolution[2, 37]. Results from some studies[38–40] indicate that chemokine receptors are also a good target for adjuvant discovery, in particular CCR4, as this receptor is expressed by regulatory T cells, a subset of T cells which normally functions in the down-regulation of immune responses induced by dendritic cells. One of these studies identified CCR4 antagonists acting as adjuvants for both cellular and humoral immune responses. Results obtained from these early studies conducted in healthy subjects, indicate that GSK2239633 was generally safe and well tolerated. GSK2239633 exhibited low and saturable systemic exposures and at the highest dose level of 1500 mg the peak inhibition of CCR4 by GSK2239633 in the blood (at 1 hour) was below 80% and less than 50% by 4 hours post-dose. Based on the low exposure and target engagement in blood, this molecule is not considered suitable for further development for an asthma indication at this time. The authors would like to thank the subjects and staff who participated in the studies. All listed authors meet the criteria for authorship set forth by the International Committee for Medical Journal Editors. Medical writing and editorial support to prepare the manuscript were provided by Dr Justin Cook and Dr Severina Moreira of Niche Science and Technology Ltd (Richmond-upon-Thames, United Kingdom), who were paid by GlaxoSmithKline for these services. These studies (NCT01086462 and NCT01371812) were funded by GlaxoSmithKline. Anthony Cahn, Simon Hodgson, Robert Wilson, Jonathan Robertson, Joanna Watson, Misba Beerahee, Steve C. Hughes, Graeme Young, Rebecca Graves, David Hall and Roberto Solari are GlaxoSmithKline employees. Sjoerd van Marle has no competing interests. AC, RW, JR and MB participated in the conception and design of the study, and in the analysis and interpretation of the data. JW and SCH participated in the conception and design of the study, and in the acquisition, analysis and interpretation of the data. SH, DH and SVM took part in the acquisition, analysis and interpretation of the data. GY, RG and RS contributed in the analysis and interpretation of the data. All authors have made critical revisions of draft versions of the manuscript and approved the final manuscript.